You know those conversations that just fill your soul? Maybe you’re talking to your best friend and you discover something new about them. Or you’re talking to your grandparents and you hear a story you’ve never heard before. Or it could even be a moment in time that you share with a stranger that ends up having a huge impact on your life. These are the conversations that we are going to talk about in today’s episode. I’m interviewing an author who has an amazing book to share with us that will help start more meaningful conversations and create more connection with the people around us. Today, I am interviewing author and adventurer Lindsay Nubern from Nuventure travels. Lindsey and her husband Adam have been traveling around the country and the world for the past 4 years. During their travels, Lindsey learned the importance of connection and how asking simple questions can lead to really interesting conversations. This led to her writing her book, 501 Questions: A Travel Game, which came out yesterday on Amazon! This book features 501 conversation starters that you can use while traveling or even in everyday life. In this episode, Lindsey and I talk about their travels and some of the conversations that sparked the interest in this topic and the inspiration for the book. The last half of the interview, Lindsey and I actually play the game to show you how one question can lead to many more! We choose questions from each of the categories and asked them to each other. I did not shorten any answers in the interview, so you will get a real life example of how the game works. I had so much fun playing this game with Lindsey and I love the book. I have already started using it in everyday conversations and it’s making a huge impact with the way that I connect with other people. Plus, interesting learn many interesting tidbits about me and Lindsey as we plan the game in the episode! Buy Lindsey's book "501 questions: a travel game"! 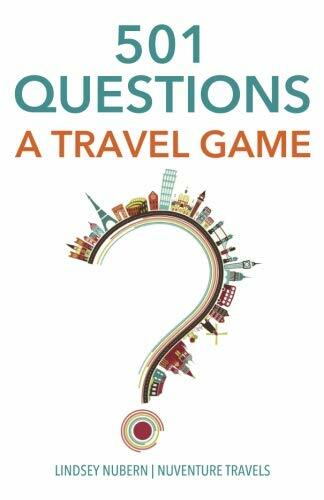 Lindsey’s book “501 Questions: A Travel Game” is now available on Amazon!! Once you buy this book and start amazing conversations in your life, be sure to leave Lindsey a glowing Amazon review!! It helps more people to find her book and start their own conversations. Downy Wrinkle Releaser - A travel must have!